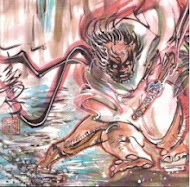 Cover Image: As with every cover prior, this image is a close-up of page 1, panel 1 of Chapter VII. We are looking at Nite Owl’s goggles, the reflection of “Archie,” his owlship, clear in the lens, the smudged soot emblematic of the blood stain on Comedian’s smiley-face badge, a running motif throughout this series as the specter of a “mask killer” looms over everything in this story. Panels 1-4: Pulling back, we see that the person who slid a finger across Dan’s goggles is Laurie. The goggles rest around the neck of Dan’s Nite Owl suit. Throughout much of this chapter, the empty Nite Owl suit will be looking down on Dan and Laurie, like some disembodied spirit condemning them for giving up their heroic identities and ideals. Additionally – as we will learn in a couple pages - the empty suit can also be seen as Dan’s father symbolically condemning his son for not following in his footsteps. 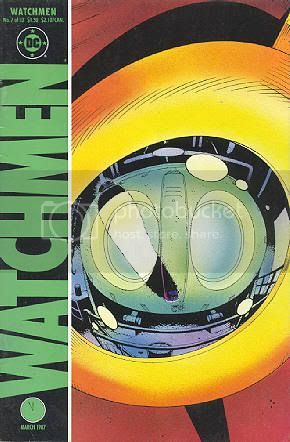 Labels: Alan Moore, annotations, Chapter 7, chrisbeckett, cover image, Dave Gibbons, Page 1, Watchmen, Who Watches the Watchmen?